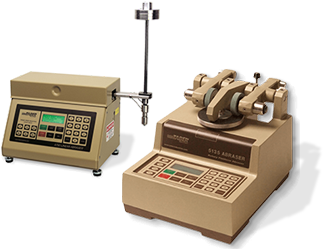 Utilizing interchangeable test attachments, both the Taber® Linear Abraser and Taber® Reciprocating Abraser provide tremendous versatility for conducting wear and abrasion tests. The Wearaser® Collet Kit is supplied as a standard accessory with the Taber Linear Abraser and Taber Reciprocating Abraser. 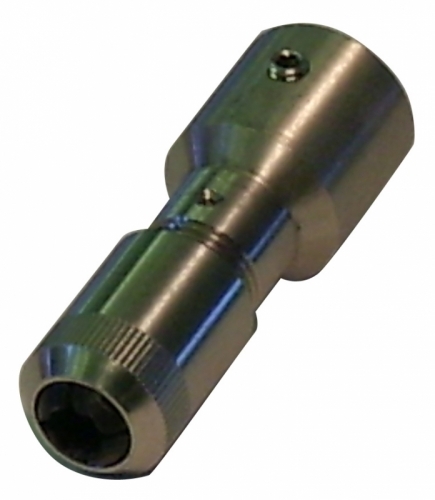 This attachment accepts the 1/4" diameter Wearaser abradants and is used for abrasion testing. 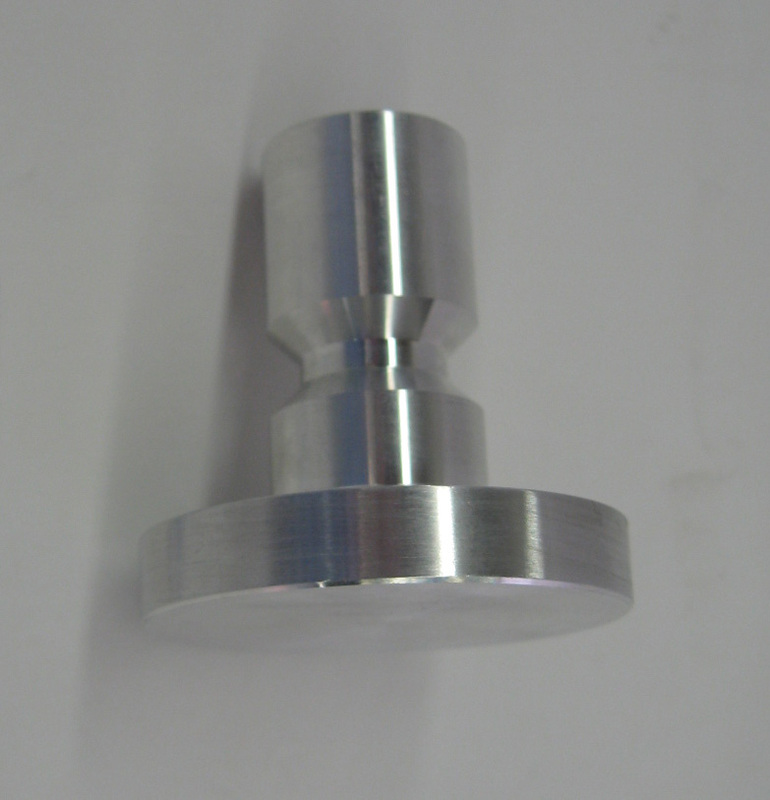 Secured inside the collet, approximately ⅛" of the Wearaser is exposed for testing. The Wearaser Collet Kit supplied with the instrument is stainless steel (98g), but is also available in aluminum (28g) or plastic (16g) if a lighter testing load is required. When testing flat specimens or samples that have little to no change in its shape / contour, a larger abradant contact area may be better suited. For this type of application, the Jumbo Wearaser Collet Kit (43g) is recommended with Taber's 1/2" diameter Jumbo Wearaser. Alternatively, the Universal Attachment can be used in conjunction with the WearDisc™ as mentioned below. 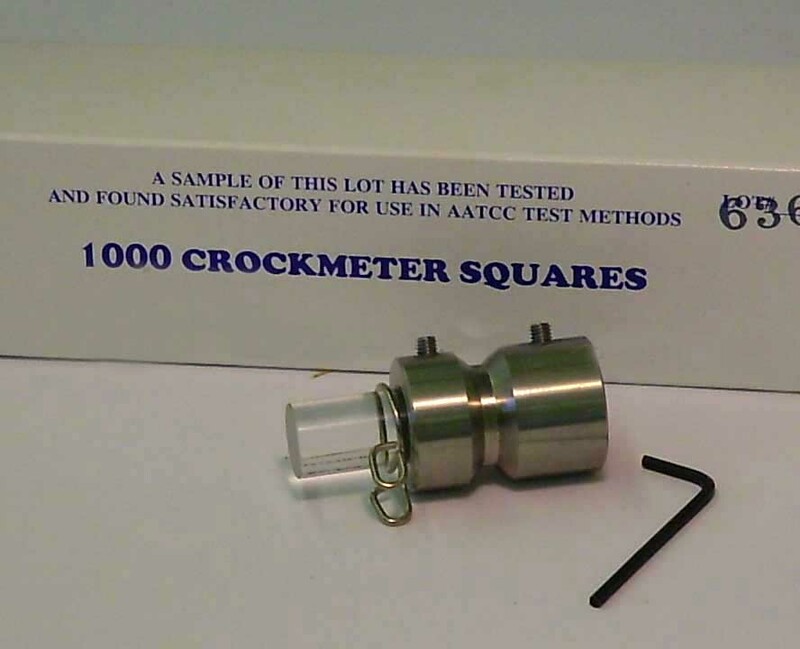 The Crockmeter Kit (166g) is used to convert the Taber Linear Abraser or Reciprocating Abraser into a crockmeter. The test piece is secured under the path of a 16mm diameter acrylic rubbing finger. A 50mm cloth is affixed to the rubbing finger, and held in place using a spring clip. Weighted to a force of 9N, the finger traverses a 100mm long straight path where each back and forth movement of the finger is referred to as a "double-rub". After rubbing specimens for a specific number of double rubs, the staining of the crocking cloth is assessed by comparing the degree of 'dirtiness' with an approved grey scale rating. Modifications to how the test is performed include moving a weighted felt pad across a surface or using abrasive paper (e.g. 281Q 3M Wetordry™) to mimic the effects of random scratching. The Crock Block Finger is an accessory used in conjunction with the Crockmeter Attachment Kit. 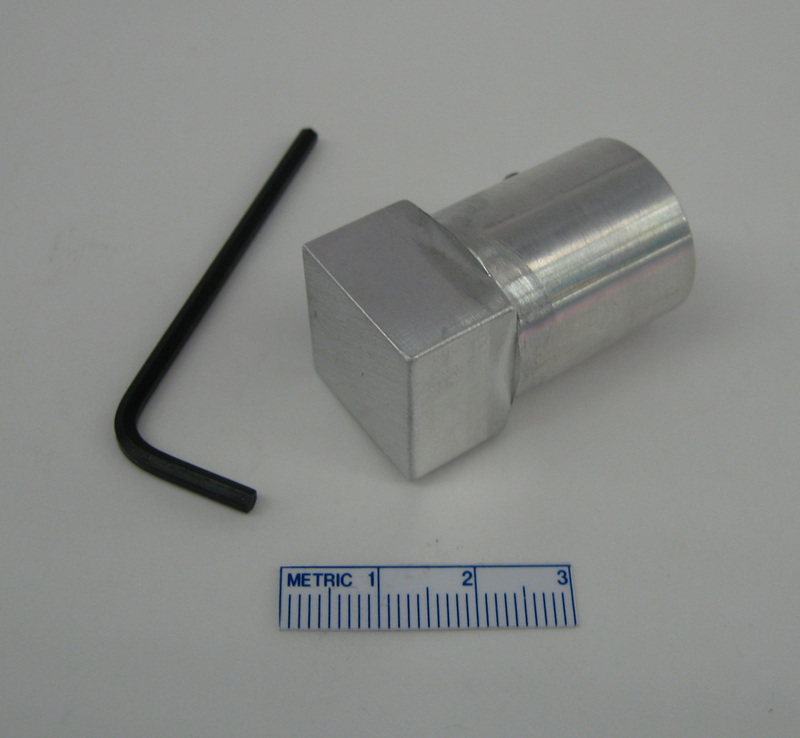 Specified in ISO 105-X12 for testing textile floor coverings and other pile fabrics, the crock block finger provides a 19mm x 25.4mm rectangular contact area and is used in place of the 16mm diameter acrylic finger. Crocking cloth is supplied with the kit allowing the operator to cut the cloth to size. 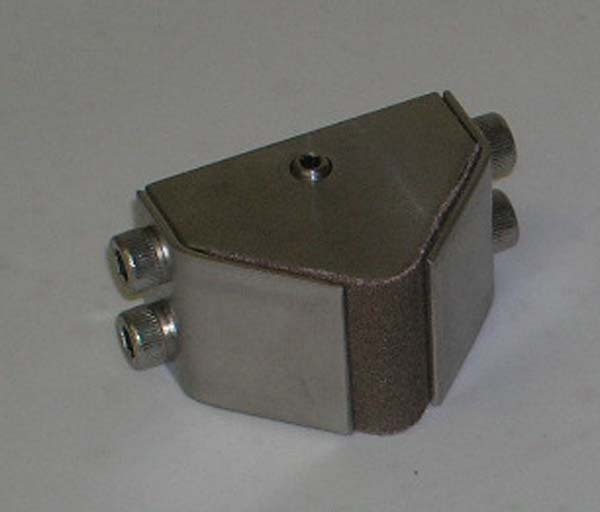 The Rectangular Crock Block provides a larger contact area that is 40mm x 85mm. 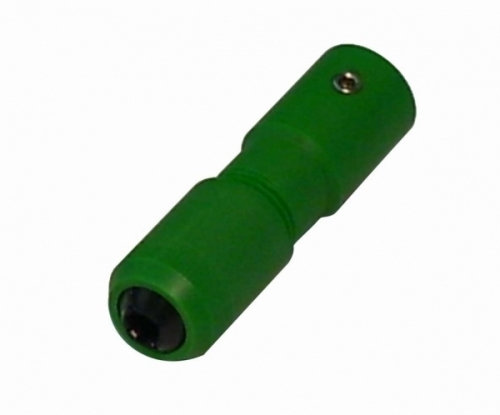 The Rubbing Adapter "C" satisfies DIN 55654 and includes a 16mm post that can be inserted into the Crockmeter Kit attachment in place of the acrylic finger. This attachment includes a pivoting base and locking pin attachment to secure crocking cloths or sandpaper. 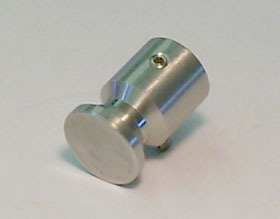 Another accessory used in conjunction with the Crockmeter Attachment Kit is the Square Crock Finger (28g). 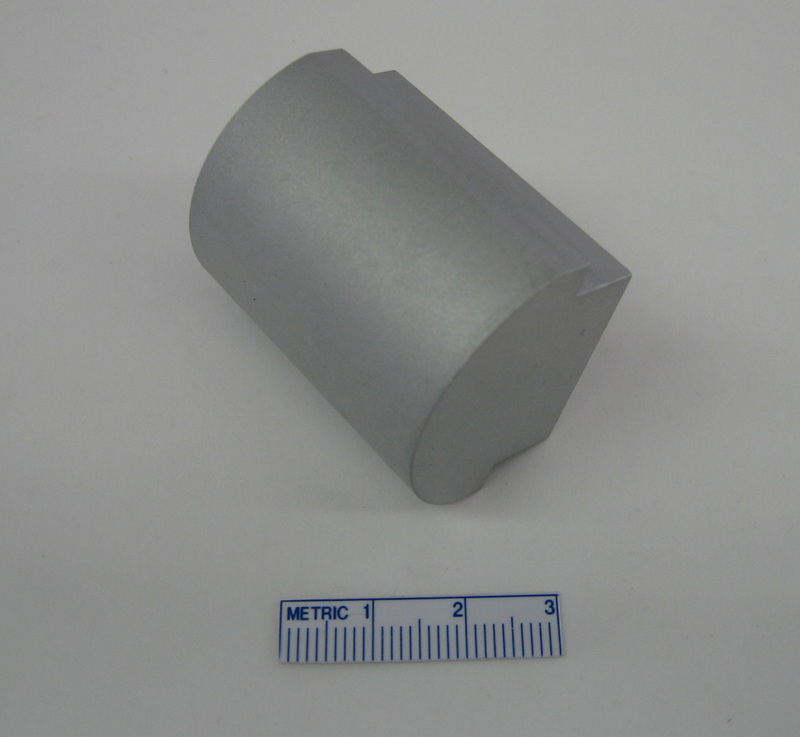 This attachment provides a 1.75" x 1.75" square contact area and can be used for conducting crocking or rub tests. Renault's Special Abrasion Tool offers a radius'd edge to satisfy an automotive rub test requirement. Manufactured out of aluminum, an abradant can be affixed with double sided adhesive tape or the attachment can be used by itself. The Universal Attachment (98g) offers a 1.0 inch or 2.0 inch diameter flat head and is ideal for testing flat-on-flat surfaces. Utilizing Taber's Weardisc adhesive or a double-sided adhesive tape, a variety of counter-face abrading materials can be affixed to this attachment and rubbed across the surface of your product. This allows you to conduct "real-world" testing by replicating specific problems or issues that might be unique to your application. For example, to evaluate rub damage caused by shipping cartons during transport, you might attach a section of the shipping container. If your product is exposed to repeated rubbing of a textile, you may consider using that as the abradant. This attachment is also useful to test the ability of the product to withstand repeated rubbing by a blunt or flat object. To evaluate the effects of abrasion damage caused by a scouring pad, Taber offers the Scotchbrite® Abrasive Pad Kit (58g). This is designed to simulate damage that might be generated by a consumer while cleaning with a scouring pad. 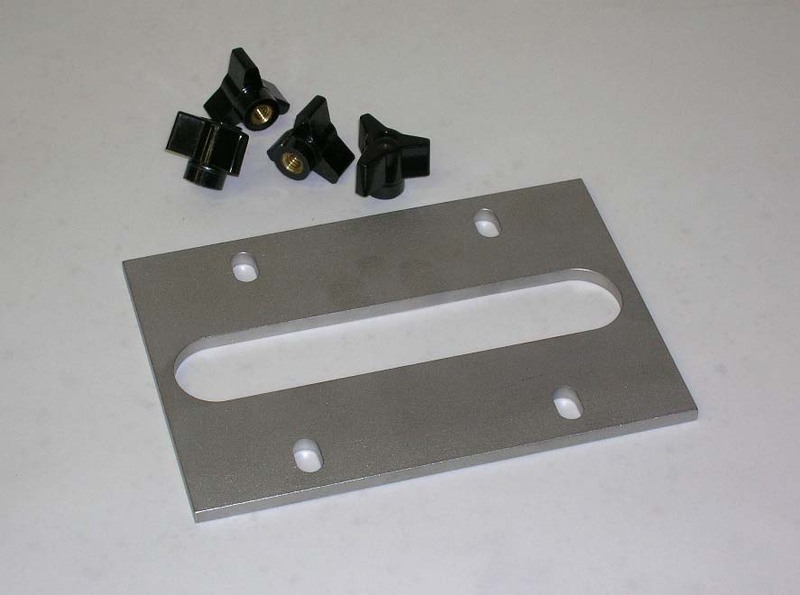 The test system includes a 1-3/8 inch aluminum square block to which light duty and general purpose Scotchbrite pads are attached with a double-sided adhesive. The light duty pad is manufactured from soft, non-woven fibers and is intended for applications where a mild abrasive scrubbing action is required. In contrast, the general purpose pad is used as a substitute for steel wool and intended for "everyday" cleaning. IMPORTANT: It should be noted that scouring pads inherently have variation and were not intended to be a tightly controlled abrasive product. For applications when steel wool is the desired abradant, Taber offers either the 10mm Square Finger Attachment (27g) or the 20mm Square Finger Attachment. Both are designed with a square contact area, and include a compressible neoprene rubber pad. This pad helps to secure the steel wool in place during testing. 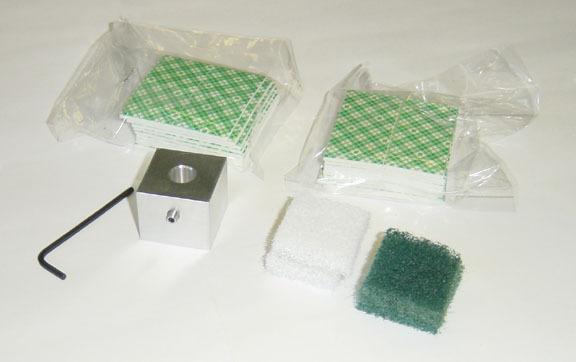 The Padded Square Abrasion Kit includes the 10mm Square Finger Attachment along with a lightweight spline shaft and special weight holder to achieve the desired testing load. The Steel Wool Holder is another option that permits steel wool scuff testing. 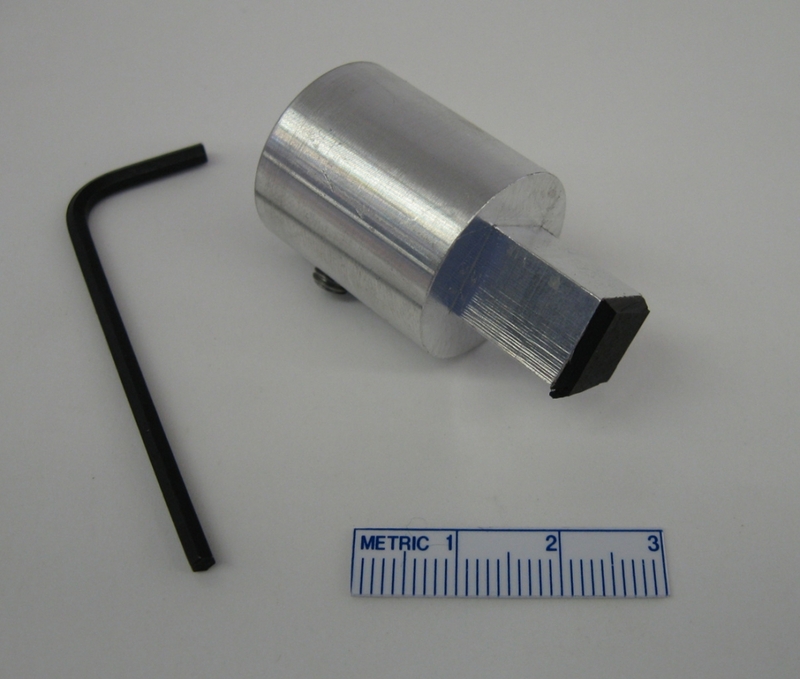 This holder is machined out of aluminum and includes a 12mm diameter opening. A gently rolled section of steel wool is inserted into the opening, until approximately 1cm of the steel wool is exposed. IMPORTANT: It should be noted that steel wool inherently has variation and was not intended to be a tightly controlled abrasive product. The Brass Brush Holder Attachment (79g) satisfies the test brush requirements of General Motors GMW 14125 for testing flat carpets (e.g. needle fleece carpet). 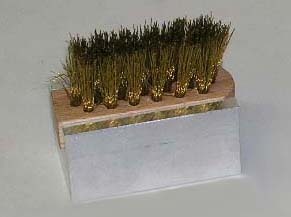 The brush includes brass wire, set in 3 rows affixed to a wooden back. 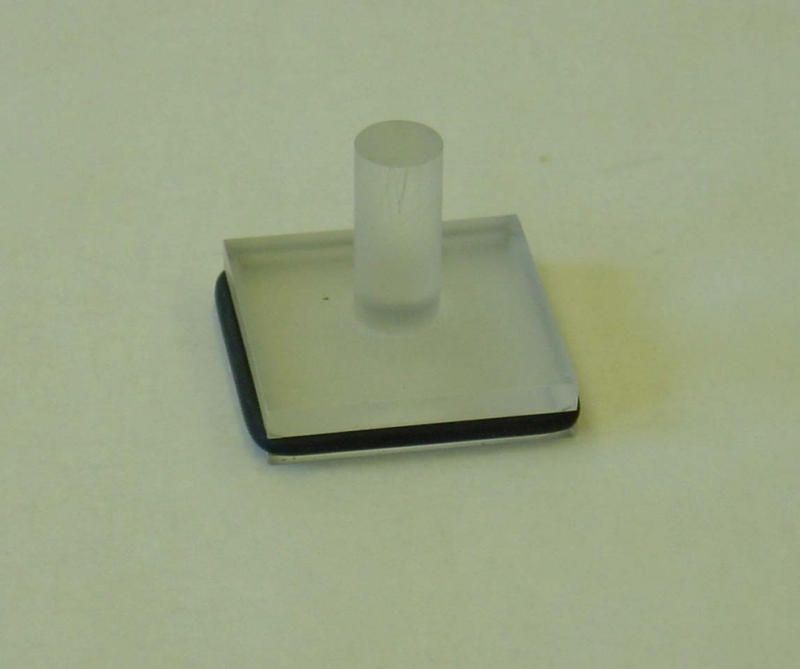 The Wide Slot Specimen Holder is recommended when testing carpet or textile specimens with the brass brush. The Test Wedge Kit (180g) satisfies the requirements of General Motors GMW 14125 for testing textile protection hoses, artificial leather and upholstery materials. The test wedge has a radius (R5) with two faces 90 degrees apart, to which a small piece of sandpaper is affixed. When testing hose material, it is recommended to support the specimen with a mandrel to avoid deformation during the test. For artificial leather or other textile products, Taber's Fixing Plate Kit is suggested. 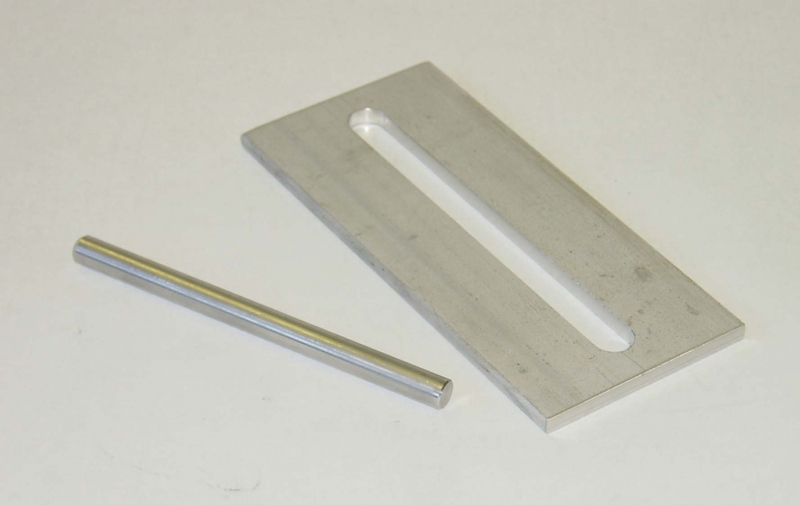 This kit includes a plate with an 11mm x 140mm opening and 8mm diameter rod. 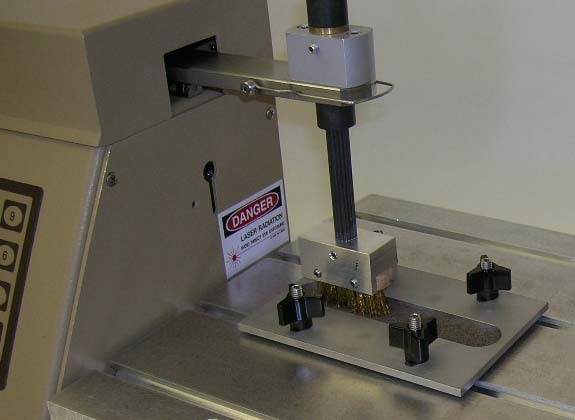 Samples are placed over the rod and secured with the fixing plate, allowing the abrasion to occur at the apex of the rod. The Test Wedge Kit may also be covered in #10 Duck Cloth to test upholstery materials. 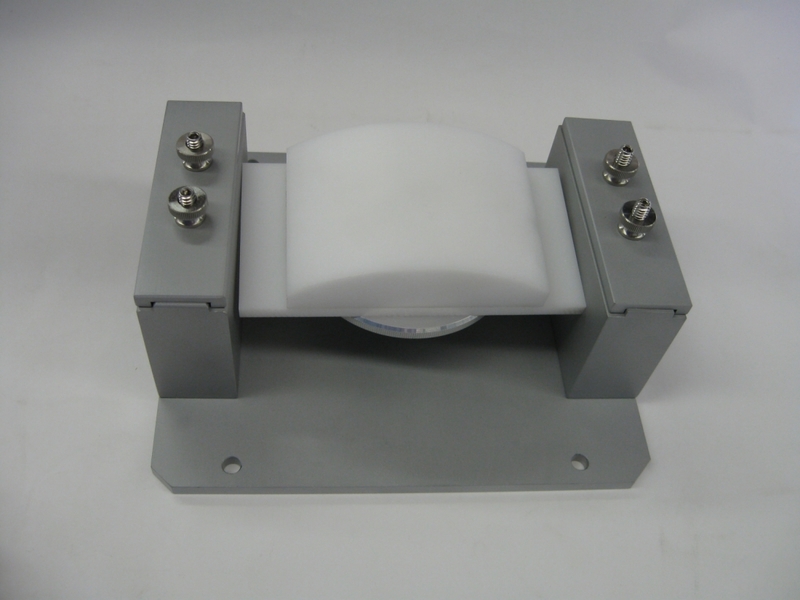 Instead of the Fixing Plate Kit, the GM Textile Pre-Tensioning Fixture is offered. Specimens are clamped into the fixture, then a dial adjustment raises the specimen support and introduces a pre-tension on the specimen. The Precision Knuckle Attachment (135g) accommodates a variety of rigid, counter-face abrading materials (e.g. rubber, wood, etc.). 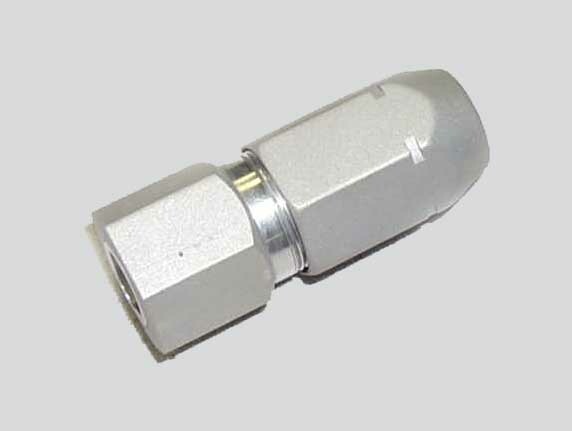 The attachment includes a threaded stud and nut to secure the abrading material. 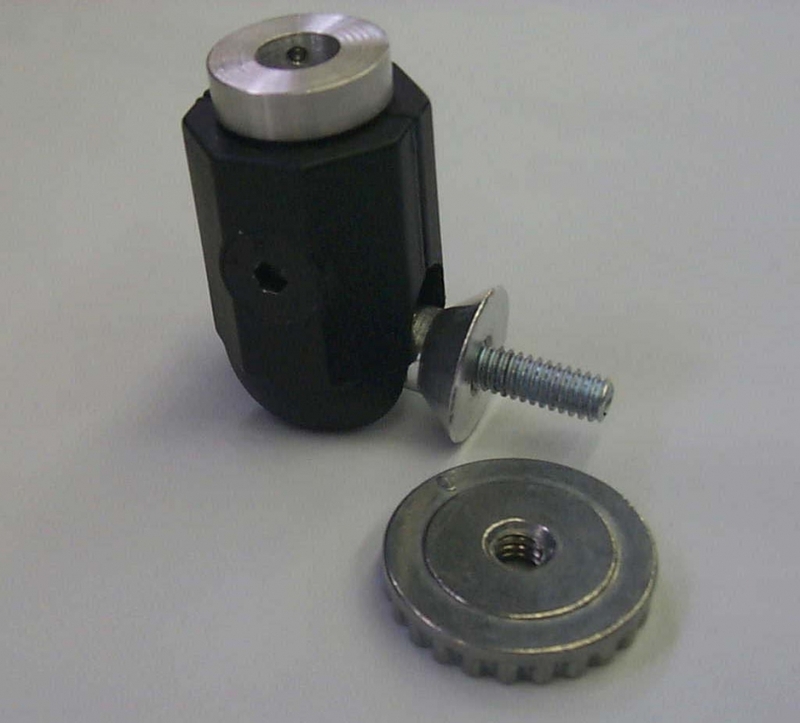 This unique attachment includes a ball and socket design, which enables the material to be rotated 180 degrees.